God is the great giver of gifts. God gives us the gift of life, the gift of relationship, and the gift of new, restored life and relationship. Out of his unfailing love for us, God has given us the gift of himself in Jesus Christ, who brings redemption and restoration to the fallen creation. The Bible department focuses on who God is and what God does. As the “Bible” department, our starting point is Scripture. Elementary and middle school students build a strong foundation by studying the stories and people of the Bible. High school students build on this foundation by exploring the deeper logic of the Christian faith and choosing from electives on special topics like Apologetics, Old Testament Wisdom Literature, and the Gospels, and exploring the ethical foundations of everything they have learned. “Growing in grace and truth” beautifully captures what we want our students to do in our classes, because grace and truth go together. The truth that we study is God’s gift--God’s grace--to us. But more fundamentally, grace and truth go together because Jesus Christ is God’s grace and God’s truth. The Bible is God’s gift of truth to us because it leads us to the One who is God’s gift of himself to us, the One who said, “I am the Way, the Truth, and the Life” (John 14:6). Students learn to read the Bible this way--not as a loosely-organized collection of true statements, but as a beautiful, complex harmony pointing to God’s gift in Christ. 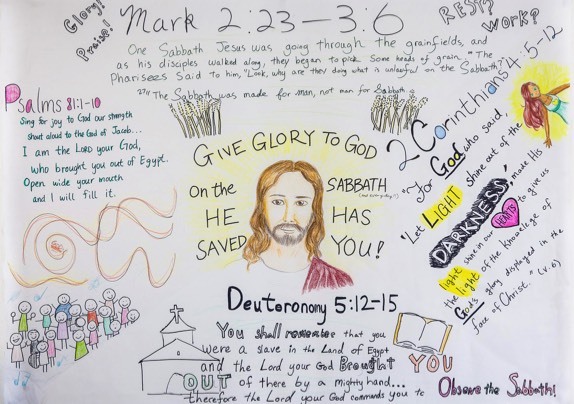 This poster made by ninth-graders brings together passages from the Old and New Testaments, exploring how their individual messages find fulfillment in Christ. Similarly, in 12th grade Bible class (Ethics), seniors carefully develop a Christian perspective on their senior comprehensives topic. To be sure, this task calls for finding verses. But it also calls for thinking through those verses, and their senior comprehensives topic, in light of the broader story of God’s grace and truth given to us in Jesus Christ--God’s great Gift. Tom McGlothlin is the Head of Bible at CAJ. He taught Bible at CAJ from 2007 to 2009 and returned in 2015. The Bible department is made up of over 20 teachers, who bring a rich variety of perspectives and background to the classroom.